We came in the situation that we had a number of permit business processes with a lot of similarities. The process is triggered by an incoming request. A part of the request payload is equal for every permit request (like details of the requestor). The rest of it is permit specific. E.g. Event location or dump location. The process starts with some overall initialization of email addresses, permit specific variables, etc. After that a new case/file is created and it’s status is initialized. All case processing starts with a decision. For rejected request the status is set to ‘Reject’ before closing the case (10). For approves requests the status is set to ‘Approve’. Than some permit specific actions follow. E.g. tent usage at a event permit. The permit document is generated as a PDF document. The permit document is send to all stakeholders. This differs depending on the permit type. Perform other permit specific actions like sending a bill or not to the requester. And finally set status closed and close the case. As can be derived from the overall structure the process flow is more or less the same for all permit types. This advocates for one (BPEL) process with some permit specific decision points which makes it a little less straight forward but doable. Complications start when the payload comes into view. Every permit type has it’s one specific payload (with some overlap). This does not really plea for one generic process. In this situation every instance has to deal with some irrelevant data fields (to other permit relates fields). Things get even more complicated when changes for a specific permit type carry through. A redeploy impacts also the other permit types. This is an undesirable site effect. 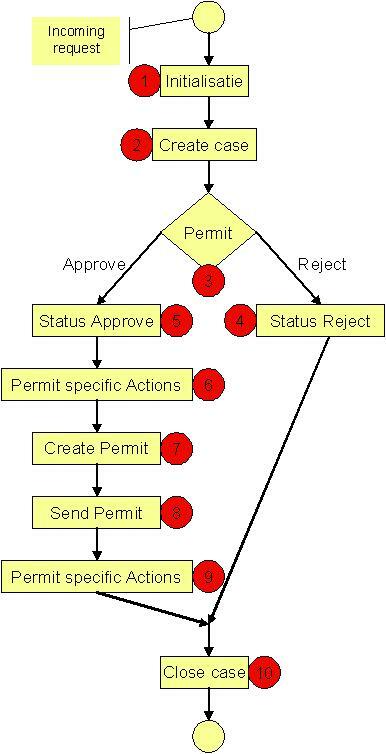 I created one permit BPEL process using a strict naming conventions. Everywhere the permit name is used I used the following structure: <prefix><permittype><suffix>. Suffix Permit (Vergunning in dutch). To get the other permit processes, I created an ANT script. After setting some properties, the execution of this script has the following result: a complete project is copied and all permit type references are replaced. To finish the new permit request Business Process all permit specific changes must be applied. The remainder of this chapter contains the content of the properties file, the ANT script and some explanation. The global part of this file is general and part of almost every ANT script. The template part contains the relevant properties. Delete the destination folder. If the permit type already exists, it is recreated. Copy the complete source project to the destination. During this copy operation two replacement filters are applied. All occurrences of these word in the file content are replaced. Finally, also a number of file must be renamed. This happens in al the move operations. As a SOA and BPM professional, Marcel is an experienced consultant in the field of process design and process modeling. Within this field system integration and IT-transcending business processes have Marcel's special interest.